Some books should be read by everyone. Subtitled “A Doctor’s Reflections on Race and Medicine,” this candid discussion of race and culture demonstrates the power of the domain of medicine. Dr. Tweedy places his personal story of becoming a physician at the service of a much-needed discussion of the impact of race on health and healthcare. He examines the prejudices of white society and also confronts his own biases. His generously honest telling creates understanding. Dr. Damon Tweedy photographed in the studio on Wednesday, October 28, 2015. Tweedy opens his book with a dramatic moment. It is the late 1990s, the middle of his first year at Duke Medical School and he has done well on his mid-term exams—he’s within the top half of the class. He’s flying high. His class is taking a break, having just heard an exciting lecture introducing the students to the clinical applications of their newly acquired knowledge of physiology. 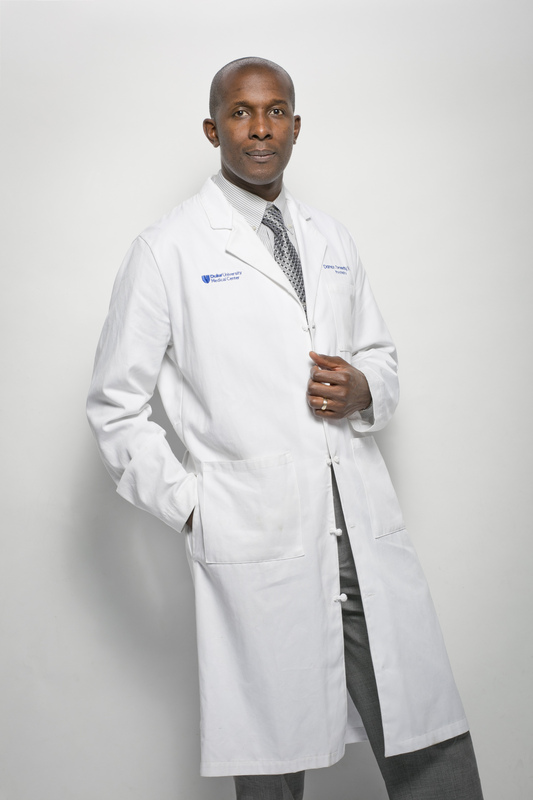 His tentative confidence as one of the few black medical students in his class is rising. And then, returning to the classroom for the second half of the lecture, the professor confronts him and asks if he’s there to “fix the lights.” He is confused (after all, he has been attending this class for several weeks), but he knows immediately that he has been mistaken for a maintenance man. “You can see how dim it is over on that side of the room. I called about this last week,” the professor says with irritation. Tweedy describes an uncontrollable physical reaction to this confrontation: “The sounds of the classroom seemed to vanish. So did my peripheral vision.” The author makes us feel his distress, his diminishment, the inadequacy of his reply. He is distracted for the rest of the class, fragile confidence now shaken to its roots. Tweedy’s (black) friends tell him to laugh it off. “What else are you going to do?” they say. And indeed, he reviews his options and decides there is nothing to be gained by lodging a complaint. Instead, he redoubles his academic effort in an attempt to prove—to himself, as well as to his professor—that he belongs at Duke. This incident connected me to the author from the outset, reminding me of the story told by Dr. Herbert Goldstone, who also felt profoundly “other” in the medical student’s world. Faced with “antisemitism so thick you could cut it with a knife” during his internship at University Hospital in Baltimore in 1933, Goldstone also could not complain. Like Tweedy, he resolved to not only exceed his supervisors’ rather low expectations for his performance, but to be better than all the rest (Herbert Goldstone oral history #159, Jewish Museum of Maryland). The strategy worked for both men; they got top marks. 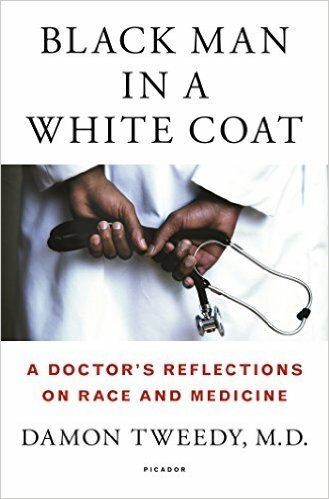 Black Man in a White Coat examines how race shapes access to and delivery of healthcare in America. He describes the inadequate care available in poor, rural areas, something he learned about when he saw patients at a clinic staffed by Duke medical students and their volunteer supervisors one day each month. In a county where the population was about 50% African American, all the patients at the clinic were black, working at jobs that didn’t offer health insurance, unable to afford medication for diabetes or high blood pressure. Dr. Tweedy’s experience connecting to a racist, white patient who initially refuses to speak to a black doctor is uplifting. The doctors around him were disgusted but not surprised by the patient’s blunt expressions of racism and offered Tweedy the option to have someone else assigned to treat this man. Tweedy goes ahead, however—mostly out of a determination not to be labeled over-sensitive by his colleagues—and eventually the patient, his family, and their doctor finally overcame their mutual antipathy to achieve a warm understanding. More eye-opening was Tweedy’s awakening to the more subtle ways that a doctor’s possibly unrecognized bias adversely affects patient care. His case in point is a black man admitted to the hospital with chest pains. Observation and testing rule out a heart attack, but in a standard care protocol, the doctors recommend that the patient stop smoking, undergo a follow-up stress test, take a daily aspirin and blood pressure pills. The patient, middle-aged, generally fit and otherwise healthy, is convinced by his chest pain episode that he’s done with cigarettes and assures his doctors he can quit “this time” without going back to smoking. But he balks at the blood pressure pills, aware of their sometimes unpleasant side-effects. When he tells the doctors he’d prefer to try “life-style interventions” before medication, they challenge him: “What do you know about life-style interventions?” Hearing this, Tweedy, an intern, first considers it may not be as disrespectful as it sounds. They are working in a public hospital, where poor and uneducated patients of all backgrounds are often unable to make lasting changes to unhealthy habits. But this patient calmly pushes back: “My understanding is that diet and exercise changes can be tried for a while before starting medicine. I have a lot of room for improvement with both.” Tweedy was encouraged by this reply, but his supervisors were doubtful. The conversation continues with the doctors trying to assert the need for medication and the patient trying to assure them of his commitment to diet and exercise. “Just give me a month. Two at the most,” he pleads. “I understand this is serious.” Finally, the doctors acquiesce. As soon as they leave the patient’s room, however, the doctors begin talking about the patient’s “disorder.” “Probably obsessive-compulsive,” they agree, and suggest a psych consult. Although he says nothing, Tweedy was disturbed and angered by this exchange. For one thing, he himself had been diagnosed with hypertension as a student, and with the help of university clinic doctors had been able to get his blood pressure under control with exactly the diet and exercise interventions the patient had suggested. Tweedy knew this patient’s blood pressure readings indicated he was a good candidate for this kind of treatment. Instead, the doctors entered a diagnosis of OCPD—obsessive-compulsive personality disorder–on the patient’s chart, labeling him in a way that could prejudice future treatment. Why were the doctors so dismissive of this patient’s wishes? At the time, Dr. Tweedy felt powerless to confront his superiors with his suspicions. Today, an accomplished psychiatrist and assistant professor at Duke University Medical Center, he has written a book which raises everyone’s awareness of the need to be vigilant about our own unconscious biases and unrecognized assumptions.